Work Work of feet trains the most important body´s parts - waist and permanent stances. Begginers learn that waist leads movement, his body follows him and feet are fictured. With power relaxation the want and back are using simultaneously. The waist at practise Hungkar must be mobile on right base. 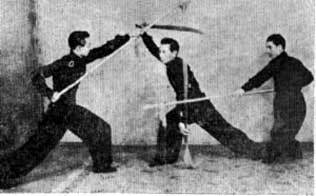 Hungkar contains two parts of steps and stances main and secondary, which unfold from main ones, but with different application. different application. Begginers start with training feet in low and wide stance and steps. This hard training is the main stonephysical condition begginers, it trains trunk, feet, waist, sides and all moving system ( muscles, bones, joints and sinews). It prepares them for further training in future and protects ahead to wound during the training and their life. 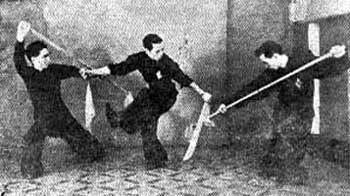 Traditional Hungkar is known it is intense connection for classic practise, it means it is stance and steps, which are much low and wide to another systems Kung fu. It giwes learnes the right base. At first they must practise technique and then application. The basic basic stone is "external", formed with muscles and joints. The basic This basic stone are knees, their stability and functionality. The Basic stone is waist for change direction and stop. The basic The basic stone is internal and external "Chi". Physical power is for begginers limited. Stundents learn and improve function their body. The total number is 10 plus steps and training stances. Explosion "Right stance" means: a. permanent stance b. strong stance c. flexibil stance. The static energy leads to demage joints at traditional training we can use the low and wide stance, these ones are in application higher and more mobile for higher effectivity, surprice and speed. The free fight is characterized for that. The Greatmaster Lam Cho says : "At first At first you learn win, you must learn to stand firmly". In another way you must increase power and technique. Master Lam Chun Fai clains: "The fighter without the right base builds an sand".